The new processor is built using the 10 nm process and has a tri-cluster configuration with two Cortex-A73, four Cortex-A53, and four Cortex-A35 cores. First devices to use it are expected to debut in the second quarter of 2017. Although the deca-core Helio X10 and X20 processors by MediaTek did not become as popular as expected, the chip maker is now taking this design approach to a whole new level. The Helio X30 comes with two key improvements over its predecessors, using the 10 nm process and support for dual-camera setups. The tri-cluster architecture of the Helio X30 includes the following cores:[email protected] GHz, [email protected] GHz, and [email protected] GHz. This new chip also comes with a 4G LTE Cat.10 modem, a hardware-based 10-bit HDR10 decoder for 4K and 2K resolution video content, not to mention its ability to handle dual 16 MP cameras. The new manufacturing process leads to a 50 percent increase in power efficiency while allowing the Helio X30 to be around 35 percent faster than its predecessors. Mass production of the MediaTek Helio X30 has begun and device makers can already purchase these chips. However, the first devices to use it are expected to arrive by the end of this year's second quarter. BARCELONA, Spain – February 27, 2017 – Today at Mobile World Congress, MediaTek Inc. announced the commercial availability of its MediaTek Helio X30 system-on-chip (SoC), the most powerful addition to the Helio family for today’s high-end smartphones. 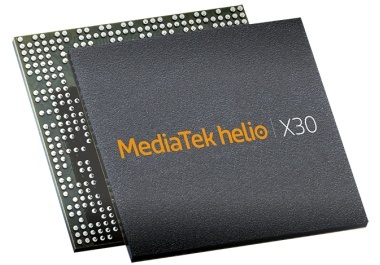 MediaTek Helio X30 is entering mass production and gaining accolades with design wins. Smartphones powered by this flagship chipset will be available in Q2 2017.